"I search for the realness, the real feeling of a subject, all the texture around it...I always want to see the third dimension of something...I want to come alive with the object." A.Wyeth The widely admired American Realist painter Andrew Wyeth died recently at the age of 91. Under the tutelage of his father, painter and illustrator N. C. Wyeth, Andrew readily mastered the demanding techniques of watercolor and egg tempera painting. His principal subject was the landscape-rural, austere, sometimes bleak, often wistful or nostalgic in mood. 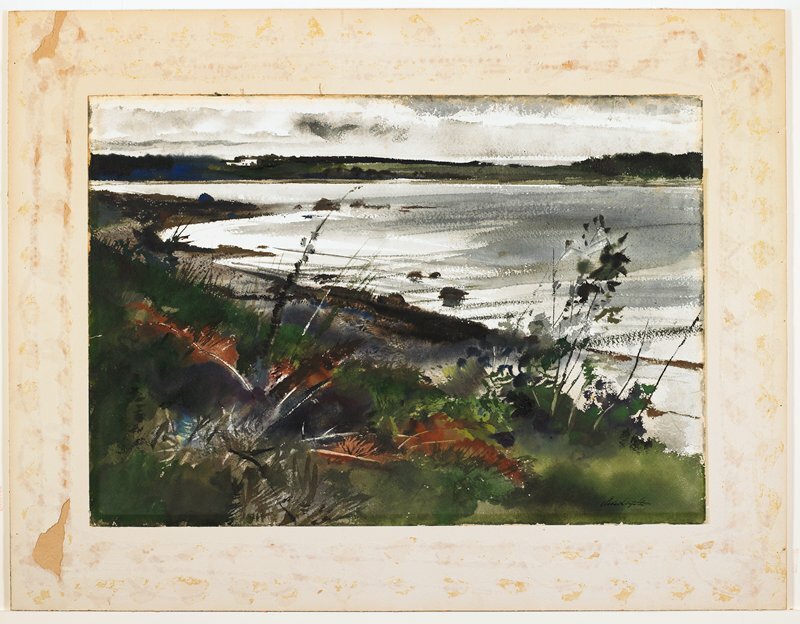 Painted when Wyeth was 27 years old, this watercolor depicts a prospect along the St. George River near Cushing, Maine. In the distance at the left is Broad Cove farm, the family's summer home and the setting for rural landscapes throughout Wyeth's career. This watercolor, the first work by the artist to enter the MIA's collection, reveals his sensitivity to the beauty of nature and his extraordinary control of an intractable medium. Doll & Richards, Inc., Boston, Mass. (original paper label in object file); Mrs. Bergland; Hugh L. B. and Elizabeth Bergland, Weldon, Ill.; James W. and Emmy Lou Moore, Decatur, Ill. (1975); by descent to James Moore and JoAnn Verburg, St. Paul, Minn.; their gift (with Madeline Moore) to the MIA, 2008. This work will be included in Betsy James Wyeth's forthcoming catalogue raisonne of Andrew Wyeth's work.